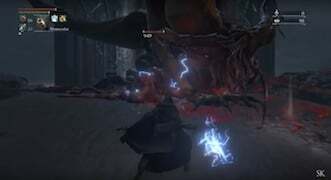 - Inherit The Nightmare Last Form - is an unused boss, recently discovered by data miners Sanadsk and Zullie The Witch. Back up your save data and check it out on glyph "sikgc3sm"
The only way to leave the dungeon is to jump into the unanimated chasm, and die. You will wake up in The Hunter's Dream, but your Blood Echoes will be trapped in the dungeon. All of its attacks land directly in front of it and/or the sides of it. Run behind it and stay there all the time. Even when it jumps and floats around, run behind it and you are safe. It's most likely a version of The Moon Presence. This one was designed to appear in The Pthumerian Labyrinth. In the German version of the GOTY Edition (wich i&apos;m playing on) it actually shows the health bar (wich reads out german name of the Moon Presence), music that activates after entering and fades out after Boss is beaten, fully functional fog door wich disappears after defeat of Boss, message popping up after Boss defeat and 2 insight wich are gained after Bosses defeat (no Echoes tho). 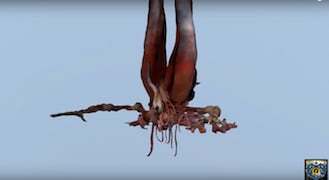 Has anyone noticed that this boss somewhat resembles the Oedon Writhe rune symbol, when all its tentacles are twirled overhead ?